Animal friendly cuisine, the benefits of choosing plant based foods. I wanted to learn more. 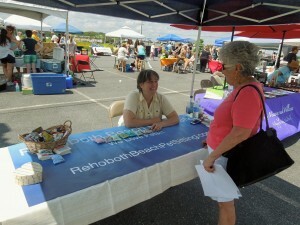 Then, I came upon the card that announced an upcoming new festival in Rehoboth Beach….VegFest! It would be a vegetarian celebration at the Beach. 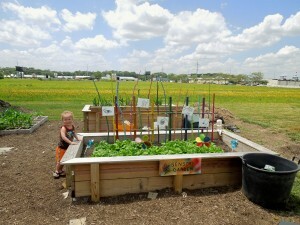 It would feature speakers, cooking demonstrations, samples, exhibitors, food vendors and a little something for everyone…loved the vegetable garden, including the sensory garden where kids could touch and feel what was growing. 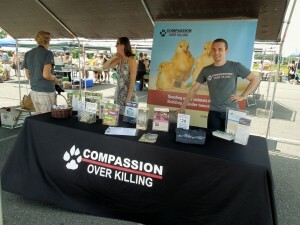 The festival was sponsored by Compassion Over Killing (COK), a national non-profit animal protection organization based in Washington,DC. COK has another office in Los Angeles. Since 1995, they have been working to end animal abuse. 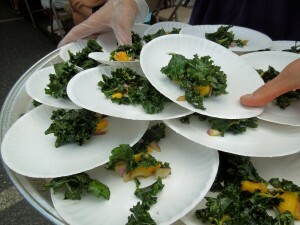 If you are in Washington on Saturday, September 28th, COK will be presenting DC VegFest. More info? Please visit http://www.cok.net. Visiting Washington, D.C. and Baltimore, Maryland? Both cities have online vegetarian resourses…where to eat in town. 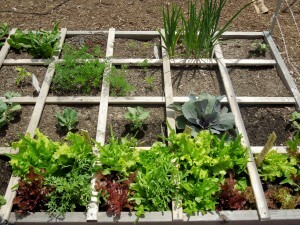 Please check http://www.vegdc.com, and http://www.vegbaltimore.com. In Rehoboth Beach you will find a social and outreach organization called VegRehoboth, a sister sponsor to this outdoor festival. It is open to all residents and visitors to our beaches. Even if you have that curiosity. Some people want to cut back, some are vegetarians, vegans, and some called themselves part-time vegetarians. VegRehoboth hosts social gatherings; make new friends, information and great food. For more information, please visit http://www.vegrehoboth.com. VegFest was held on a hot day but with a nice breeze. 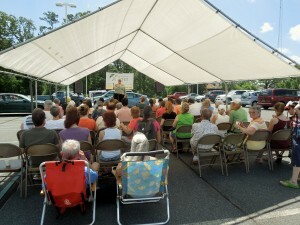 Tents were set up to accommodate the speakers and cooking demonstrations. One of the speakers, Dr. Ruby Lathon who is a holistic health and wellness expert is an advocate for plant based nutrition. She made a couple of dishes, one in particular, caught my attention. Made with kale and mango. As soon as I get the recipe, I will put it on the post. It looked so easy and it was delicious. To learn more about Dr. Lathon’s story, please visit http://www.rubylathon.com. Strolling from one booth to another I met Chef Kris. It was good to finally meet her in person and not through the postings on Facebook. Kris is a personal chef and she also holds cooking classes year-round. More info? 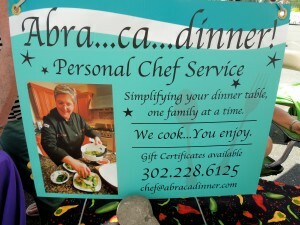 Please visit http://www.abracadinner.com. Kris also offers Dinner N Massage…in your own home. To know more about it, please visit http://www.dinnernmassage.com. Great to say hello to Kari Ainsworth. 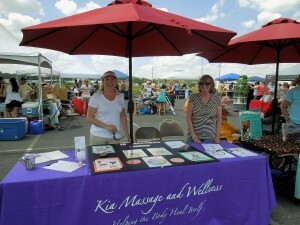 Kari is the owner of Kia Massage and Wellness. She is a Southern Delaware based Holistic Coach, working with both, men and women, one-to-one in person. She is a Licensed massage therapist, licensed cosmetologist, intrinsic coach and yoga instructor. Please call her if you want to get off from the diet roller-coaster and learn more about her passion for holistic nutrition and health. Her motto? ” Find Your Balance, Live Your Bliss”. Her website? http://www.kiamassagellc.com. 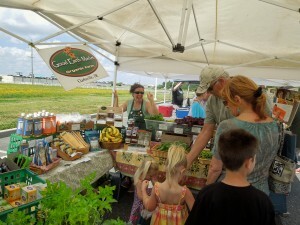 Sue Ryan, owner of Good Earth Market & Organic Farm was having a blast with her customers. Good Earth is located at 31806 Good Earth Lane in Clarksville, Delaware, only about 4 miles west of Bethany Beach on Rt. 26. Great events happening at the farm. 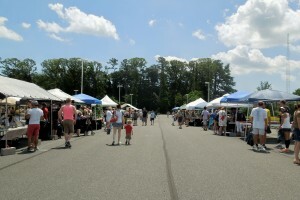 Please call 302-537-7100, or visit http://www.goodearthmarket.com. 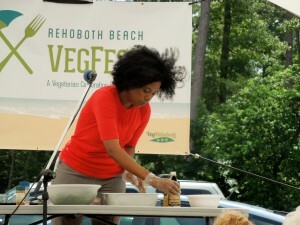 Continued on my VegFest strolling, I stopped next at Rehoboth Beach Pet Sitting Service. This, in your own home, pet care service has been in the area for a couple of years. They serve Rehoboth Beach and Lewes. They are insured and bonded. Owned by Lynn Barnett and Brent Joyce Finkbiner. Tel. 302-827-4966. They are another option, in case you do not want to take your best friend to a boarding facility. If your pet needs medication, they are able to take care of it, as well. Website? http://www.rehobothbeachpetsitting.com. 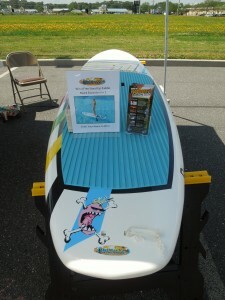 Another stop at Delmarva Board Sports Adventures. For the entire family, from Lewes to Assateague. Stand Up Paddle Boarding. They have a new waterfront location on Rt. 54 and the Bay in Fenwick Island, next to Harpoon Hanna’s. They offer a Cape Henlopen Delaware Dolphin Excursion, paddling the calm waters of the Delaware Bay in search of the many dolphins who frolic nearby. How about SUP Wellness? Yoga, and meditation on a paddle board. You may call to reserve your spot. Classes are held on a secluded Delmarva pond. Windsurfing lesson and rentals, as well. To know more, please visit http://www.delmarvaboardsportsadventures.com. It is called MERR, and that was by next stop. This is a non-profit stranding and rehabilitation organization completely committed to marine mammal and sea turtle rescue and conservation. 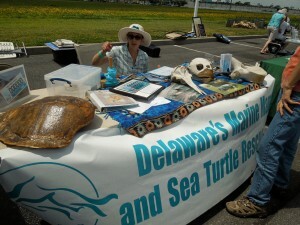 They are first responders for stranded mammals and sea turtles. Their new automobile license plate is now available. 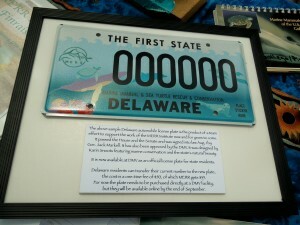 It passed the House & Senate and was signed into law August 1st by Governor Jack Markell; also approved by the DMV. So, if you are a resident of Delaware…one time fee of $50; MERR gets $35 back. More info? Please visit http://www.merrinstitute.org. 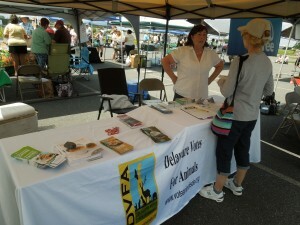 Delaware Votes for Animals….Protecting animals through political action. This is a non partisan organization and to know more, please visit http://www.voteanimalsde.org. 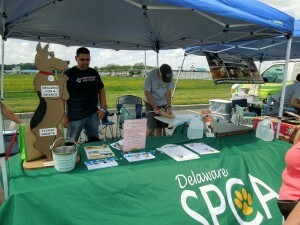 The Delaware SPCA – Georgetown Shelter is very active. 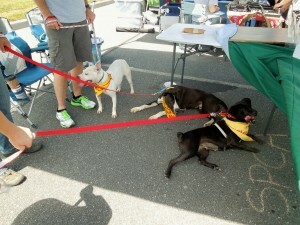 Their available dogs for adoption are always out and about, trying to find their forever home. And, they were at VegFest. The Georgetown Shelter is located at 22918 Dupont Blvd., Georgetown, DE 19947. Tel. 302-856-6361. You can adopt but they also need volunteers. 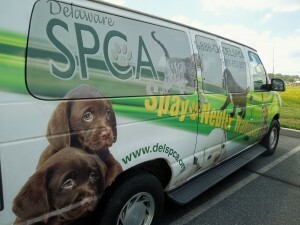 Please visit http://www.delspca.org. You can find Delaware SPCA Georgetown Shelter on Facebook, as well. This guy was in his own Oasis….being given a massage by Oasis Wellness Spa. I think he was asleep; so relaxed. 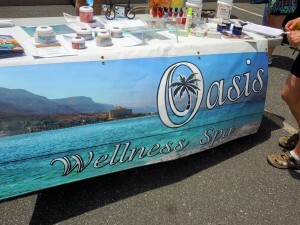 Oasis Wellness Spa is located at 415 Rehoboth Avenue with parking available year-round. They offer skincare, massage therapy, yoga…host a bridal party or a spa day with a friend or two. Just Check them out at http://www.oasiswellnessspa.net. I enjoyed every minute of it, hope they continue to have it….I think they have the community and visitor support already! Great job. Thanks! This entry was posted on Monday, June 3rd, 2013 at 10:15 am and is filed under Activities, Delaware, Delaware Beaches, Events, General, Rehoboth Beach, Southern Delaware, Uncategorized. You can follow any responses to this entry through the RSS 2.0 feed. Both comments and pings are currently closed.